Ever wonder how it is that some companies – whether they’re manufacturers, contractors or wholesalers – seem to get more than their fair share of publicity? Will we surprise you if we say that it’s not necessarily the involvement of a PR firm like ours? We took this snowmelt system in-progress photo at a ski resort in California. The set of images helped us win many high-profile story placements. Dan Frisch photo. The most important ingredient for good editorial coverage is, simply, information. Those companies with an editorial winning streak have established good connections with experts in the field… with news that travels quickly to PR-savvy managers, design engineers or communications pros. When word travels fast of a unique or interesting installation, or of professionals in the field who practice their craft uniquely, the most important next step is to get good photos of the work in progress. Many good stories have fallen flat becauseinformation came too late to the attention of someone who could respond to it, especially to those who can make arrangements with a professional photographer. Professional job-in-progress photos are the key link between your story opportunity and high-profile magazine coverage. We can always collect the information later. 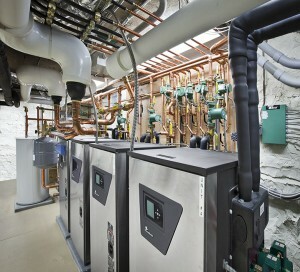 Pro shooter Dan Frisch and I left this St. Louis home knowing we’d photographed a spectacular geothermal retrofit. Look at this one for clarity, quality of lighting, depth-of-field and loads of brand value for ClimateMaster + Taco. So, please help us help you. If we at Common Ground have been brought to your attention by one of our clients – a company whose products or technology you’ve come to know and appreciate – give us a call, or send an email with news of a unique or compelling story opportunity. We’ll collectinformation quickly and help you determine the next best step in getting editorial coverage. • Take an assortment of photos, from whole jobsite images, to any close-ups you think may help to tell the story. • Be sure that people are shown in the photos. If a radiant heat system is being installed, show the installers doing the work. • Keep your back to the sun. • Choose camera angles that provide more information, visually, and always avoid those embarrassing rear-end views.